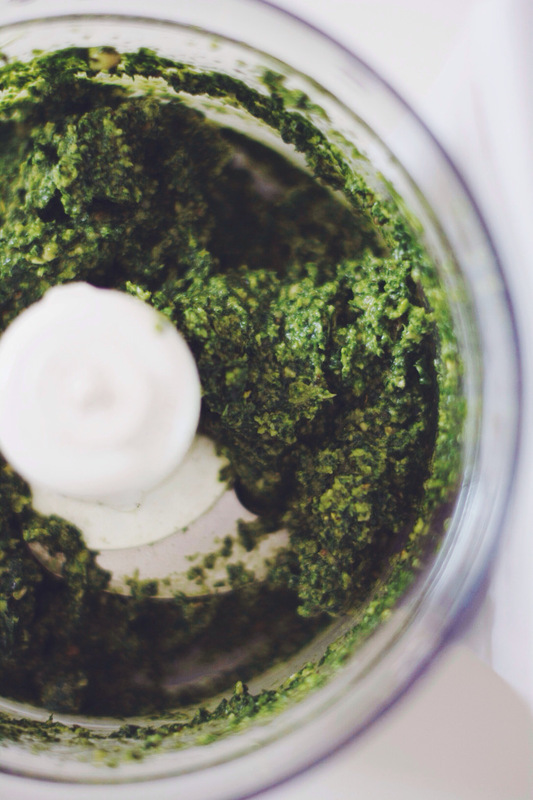 Everyone has that one recipe that they go back to time and time again, and for me it's pesto. 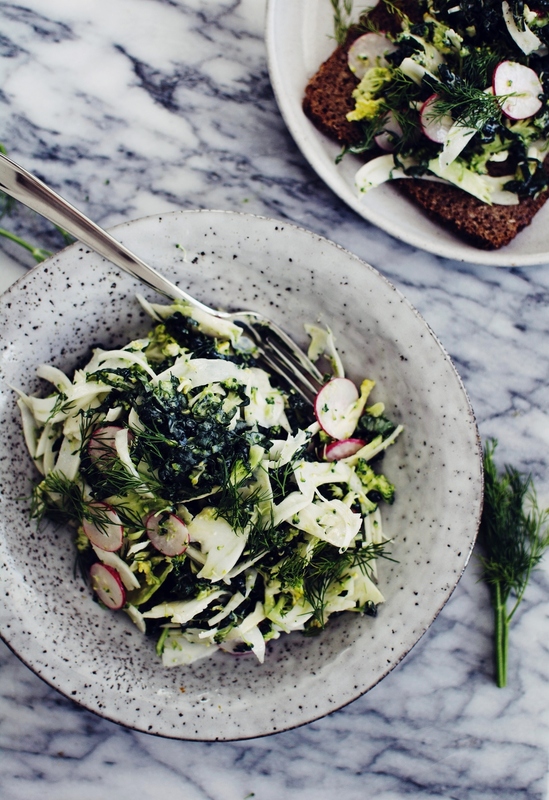 Perhaps it's the ease in throwing it together, or the fact that its traditional use is with my favourite carb, but there is something about its herby, garlicky notes that keep it firmly on my go-to recipe list. What I love about pesto is its versatility. Every green herb or leaf that I throw at it seems to work in its own right, with unfamiliar flavour profiles lending themselves to different parts of the palate, adding an element of discovery each time I try a new combination. This particular pesto is made using chives as well as basil, resulting in luxuriously garlicky undertones while keeping it classic. 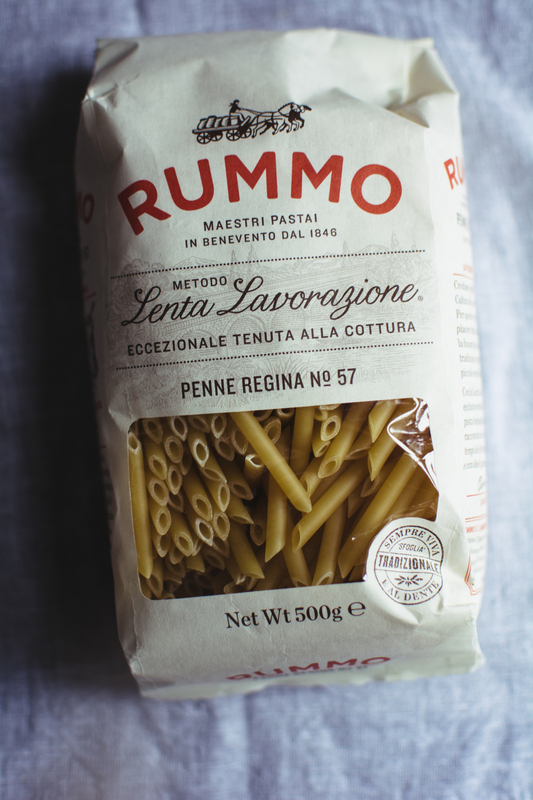 Use it on pasta like I've done here, or dot it onto ricotta on toast - it is all good. In a food processor, add the herbs, pine nuts, garlic, olive oil and a good pinch of salt and pepper and blend. Scrape the pesto mixture into a bowl and by hand stir in the grated parmesan. Add an extra glug of olive oil for good measure. 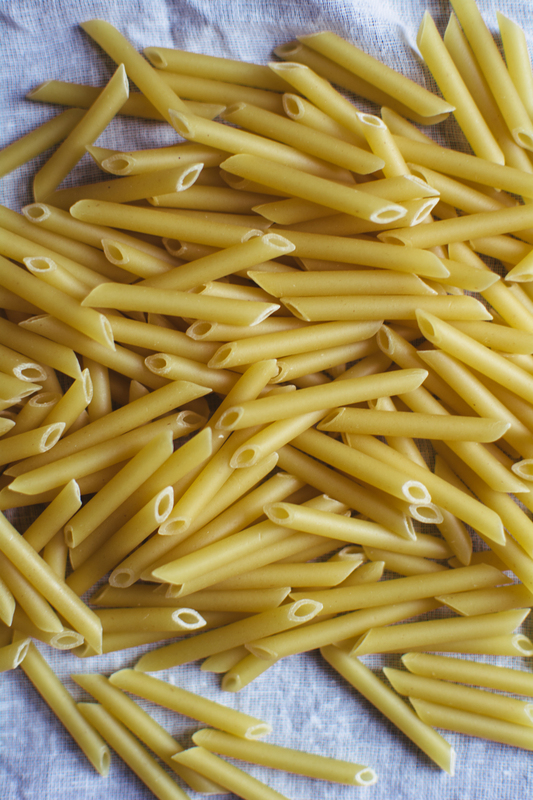 Cook your pasta of choice until al dente (allow 100g per person), reserving a little of the cooking water before draining. Add 1-2 heaped tablespoons of pesto per person, along with a splash of the reserved water. I’ve been thinking a lot about family history lately, where it all began and how I came about being on this earth. Brace yourself, I'm about to go deep. On my mother’s side it’s relatively straight-forward; our ancestors travelled from England to North America on the Mayflower, my grandpa was in the Navy, they settled in North Toronto. Thanks to a cousin taking an interest in our ancestry I’ve also discovered a bit more. For instance I have Dutch blood (in addition to the English, Irish, Scottish, French, German etc.) and it turns out I am a very distant relative to Clement Clarke Moore (that guy who wrote Twas The Night Before Christmas). I also know having looked through old photographs, that the family genes are remarkably strong – my younger brother is a clone of our grandpa, I resemble many of the women in our family, and my older brother has the family forehead, or so I’m told. Despite being far closer to my dad’s side of the family, I can’t say I know as much about them. Knowing them (grandparents, cousins, uncles, aunts) isn’t the problem, it’s our broken history that is. Like all Armenians my family originate from Turkey, and when it became clear that they would have to leave or face ‘deportation’, they conceded and with that left and lost everything they had. My great-grandpa wrote a book about his experience of the genocide, in it listing the names of our family who perished; tragically only a handful made it to Ethiopia. I know that from Ethiopia they moved to Cyprus where my dad was born, and as such where a lot of my inherited culture comes from (my father is a Cypriot of Armenian descent, as he likes to say). But what I’d like to know is what it had been like back in Turkey before they were forced to leave and start again. I want to know where they lived, how they’d drink their coffee and what music they’d listen to. Did they eat Armenian food or was there more Turkish influence? Did they stuff lahmajun with salad or roll it with lemon juice? Did they eat Çilbir for breakfast? It’s just one of those things that I’ll probably never know. Either way, I’m going to continue enjoying these Turkish eggs for breakfast and imagine that my family once did too. Divide the yoghurt between two bowls. Melt the butter on a medium heat until it starts to sizzle. Take it off the heat and whisk in the paprika. Set aside. Poach the eggs in simmering water. Add a splash of white wine vinegar to boiling water, reduce to a simmer and slip the eggs in one at a time. Poach for 3-4 minutes for a runny yolk. Remove the poached eggs using a slotted spoon and place on top of the yoghurt. 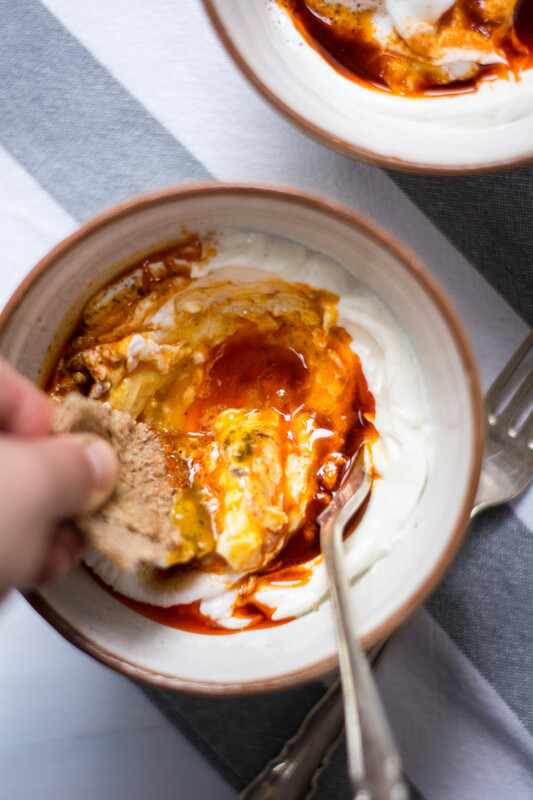 Add a dash of sumac and drizzle with the chilli butter. In 2010 I spent the summer travelling through Europe with my best friend. The original plan had been to travel along the coast of Spain through to the South of France, dip into Tuscany and head across to Hungary and other Eastern European destinations, before swinging back through Central Europe and returning home. Technically speaking we did follow this route, but we didn’t stick to our times. We stayed in Italy for as long as we possibly could without turning our Euro trip into just a trip to Italy. We started in Genova, the home of pesto, hidden restaurants and narrow streets – it really is an unknown gem. Our next stop was Pisa where we spent our days living the nomad life and the hot evenings drinking cheap cocktails by the river. Next it was Florence where we found the number of tourists quite shocking and the ice cream irresistible, before we grabbed our backpacks and headed straight for what I consider to be Italy’s capital of food, Bologna. 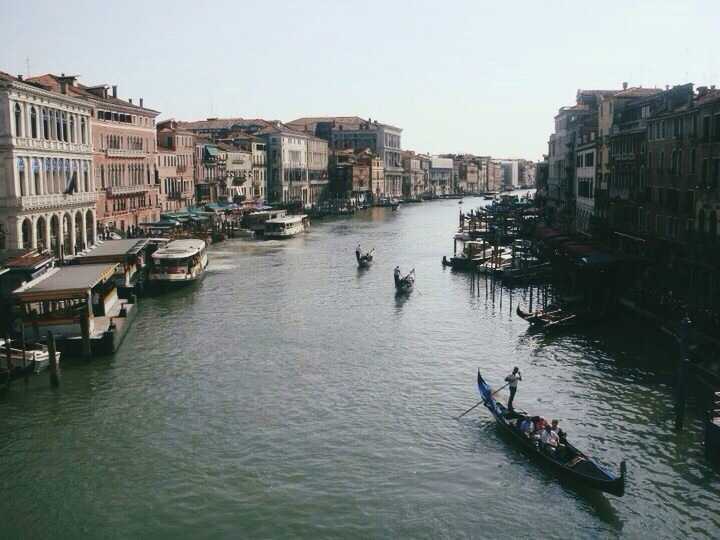 Finally we took a train to what would be our final destination in Italy: Venice. Venice has a charm different to that of Rome or Naples, it’s rather more enchanting and I suppose a little less in your face. Of course there are days where the small canal-side streets are crawling with tourists, all eager to have spaghetti al vongole in San Marco square, but what makes this floating city special is that you can turn a corner and find yourself away from the hustle and bustle and in another world in a snap. It’s pretty easy to get lost, but that’s part of the fun. We spent longer than expected in Venice, enjoying a life of somewhat luxury by staying with M’s aunt Julia in her beautiful renaissance apartment (SO Vicky Cristina Barcelona, right?). We spent our time divided between discovering the beauty of Venetian cuisine, free-riding traghettos and whiling the days away on the sandy shores of the lido. Flicking through the pages of my newest cookbook purchase reminded me of that trip, which now seems like so long ago. Better yet, it reminded me about the blog I kept while I was travelling; if you’re interested in seeing some horrendous grammatical errors and some amusing anecdotes you can find all of that here. Now about this risotto, I can’t tell you enough how wonderfully simple and delicious it is, and after trying the method of adding the wine before the rice I will never go back to doing it the other way around. The fat from the prosciutto melts into the creamy risotto, which is in turn spiked with its saltiness and that of parmesan. Truly delectable. Heat 25g butter and olive oil then add the onion and sauté for 7 minutes or so until soft but not browned. Add the white wine and cook down for a few minutes before adding the rice and chopped asparagus (reserve the spears for addition later). Stir until the rice is well-coated and opaque. Begin to add the stock, add a ladleful at a time and stir often. Don’t let the rice ever dry out before each addition. After about 15 minutes you should have reached the right consistency, but go by your personal taste. 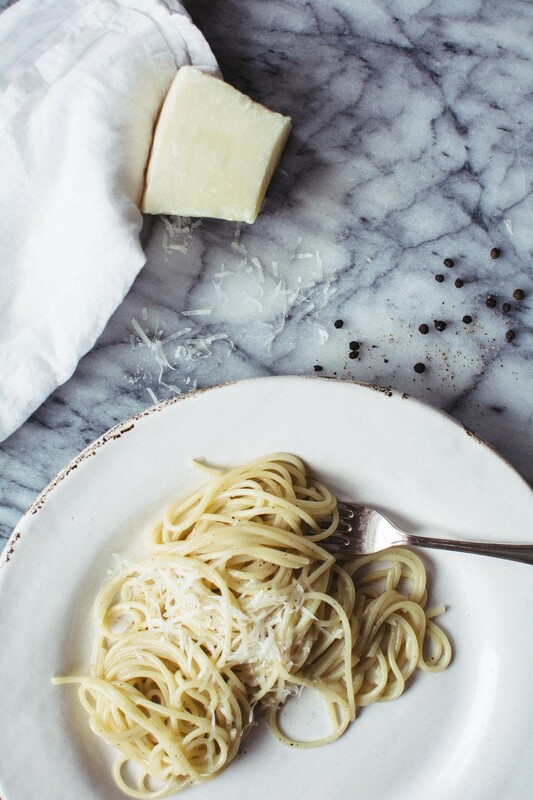 Add the remaining butter and grate in a handful of parmesan, stir until melted and distributed and season to taste with salt and freshly cracked black pepper and leave to rest for a couple of minutes. 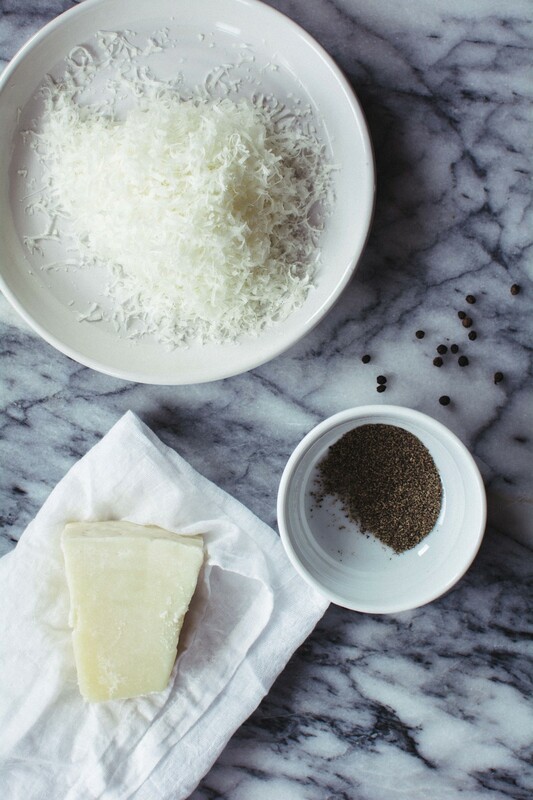 Serve topped with prosciutto and a sprinkling of parmesan. Obviously this is my favourite day of the week for many a reason. For starters I get to lounge around in bed in my pyjamas with panda eyes and messy hair without being judged, but mainly I love Sundays for the food. Being British it is expected that Sunday results in a roast, any kind of meat (or fish!) will do, it just has to be done in the oven. Be it a last minute kind of thing, a quick skip and a hop down to your local for a few slices of roast beef with a Yorkshire, or a premeditated and carefully calculated feat in the kitchen, the fruits of the pubs or your oven-slavery will undoubtedly be devoured in a matter of minutes. That is what Sundays were made for. They were also made for this. Recently my amazingly talented brother was part of a production at the Royal Exchange in Manchester, so after 2 months when I heard he was coming back down to London for one day only I knew exactly what I had to do – Sunday lunch, a roast pork belly to be precise. What I love about pork belly when roasted is that it inevitably gets a pulled-like quality and it is juicy, melt-in-your-mouth hell yes kind of good. And the crackling. Ohhhh I can’t even talk about it without salivating. Yes pork takes longer than other roasting options, but it is relatively fuss-free and absolutely worth it. Rub, roast, eat – simple. In a pestle and mortar, grind the fennel and mustard seeds until a coarse powder. Score the fatty layer of the pork, cutting through the fat but not into the meat itself. 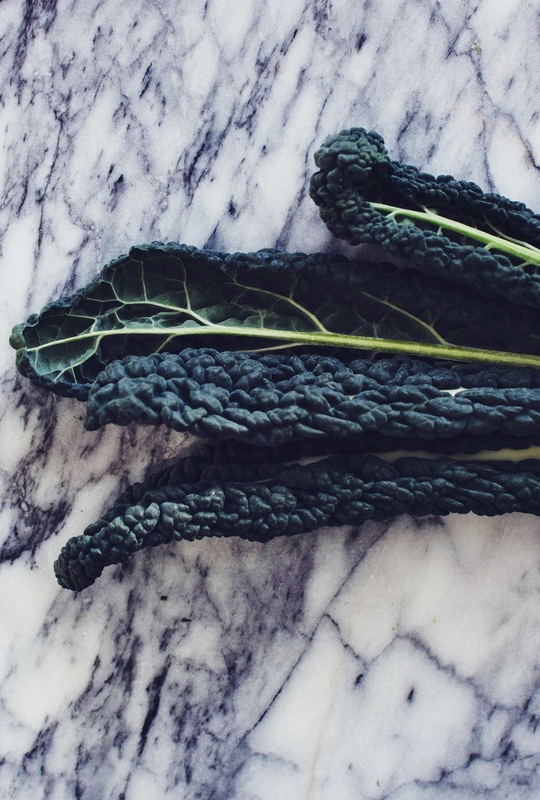 Either roast it flat or roll it up and tie it with butcher’s string – your call. Rub the pork with olive oil, chopped rosemary and the fennel and mustard seeds and season liberally. Arrange the sliced apple, onion and garlic cloves in the baking pan and place the pork on top. Roast for 10 minutes until the skin starts to blister, then reduce the heat to 170°c and continue to roast for a further 2.5 – 3 hours. 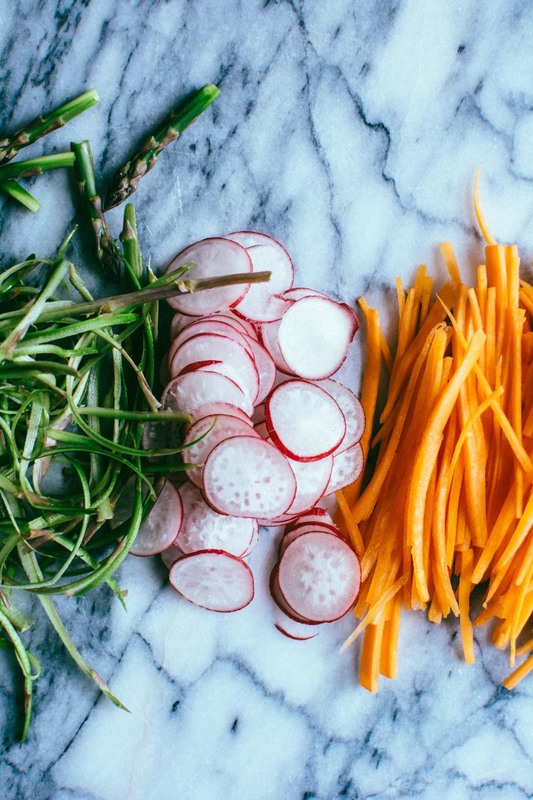 For the fennel and carrots, add to the pan for the last 45 minutes of cooking, drizzle with olive oil, add the zest of a lemon and season well. Turn the vegetables half way through cooking. Remove the pork from the pan, wrap in aluminum foil and leave to rest for about 15 minutes. Leave the carrots and the fennel in the oven with the onion and apple etc that the pork was roasting on to help them really caramelise and get even more moreish. Serve with apple sauce and mustard, of course.